Timothée Chalamet is no longer the new kid on the awards-season block – but a year after his peachy turn in Call Me by Your Name, he remains, indisputably, the most charming. 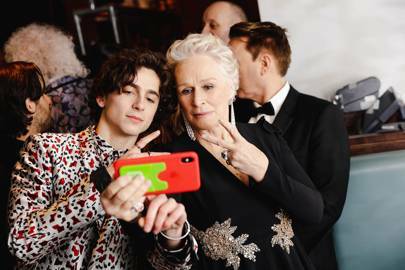 Not even veteran Hollywood thespians are immune, including (but certainly not limited to) Glenn Close, who continued her newfound best friendship with Chalamet at the BAFTAs on Sunday, where the oft-nominated pair (she for The Wife, he for Beautiful Boy) posed for selfies backstage. “Glennothée,” as they’ve been dubbed, also bonded in January at the Critics’ Choice Awards, where Close – no fool, of course-once again lived her best awards-season life by palling around with the chiseled young actor. Is it any wonder that this transcendent trio is now set to costar in Greta Gerwig’s Little Women remake? Speaking of which, legendary actress in the making Saoirse Ronan, Chalamet’s costar in that forthcoming film as well as in Gerwig’s Lady Bird, is not only a big T.C. fan and confidante but a lucky recipient of his cuddles. Her nickname for Chalamet, as she told The New York Times “Pony . . . because he’ll come up to Greta and me and nuzzle us.” Even the dog from A Dog’s Purpose has nothing on this man.